The defining features of this eastern Scleroderma species include its thick skin, the smooth to finely scaly surface which bruises slightly reddish and turns slightly reddish brown with KOH, and microscopic features. The scales are not as prominent or as large as those found on its better known cousin, Scleroderma citrinum. Like many Scleroderma species, Scleroderma michiganense has fascinating, funky spores that are densely spiny and reticulate. I have often wondered what mushrooms like Scleroderma michiganense accomplish with such spores. Does the ornamentation affect how the spores are carried in wind currents? I am picturing a laboratory room filled with round, smooth, helium-filled balloons, with a fan placed on one wall--and another room filled with funky, multi-fingered balloons. Will the Scleroderma-like balloons cluster together when the fans are turned on, getting their spines enmeshed with those of other balloons? And what would be the selective advantage for clustering or not clustering? Yes, those were three mental minutes I will never get back. Some people day-dream of normal things; others play with mushrooms too much. Ecology: Mycorrhizal with hardwoods; usually found in dry, sandy soil; growing gregariously or scattered; widely distributed east of the Rocky Mountains, from Canada to the Gulf Coast, and reported from the Southwest; summer and fall. 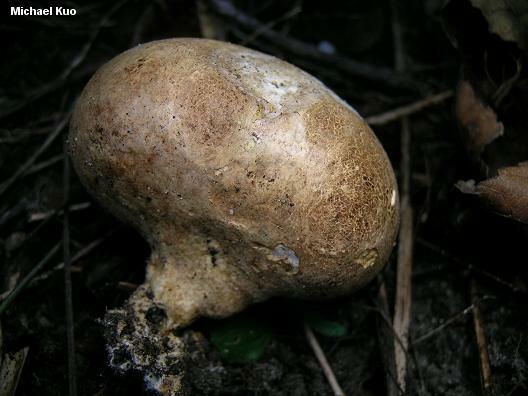 Fruiting Body: 3-6 cm across; round or shaped like an inverted pear; surface whitish to yellowish, smooth to finely scaly with tiny, grayish, flat and irregular scales; bruising slightly reddish; skin 1-2.5 mm thick; with a short, pinched and poorly defined pseudo-stem; with white rhizomorphs attached to the base. 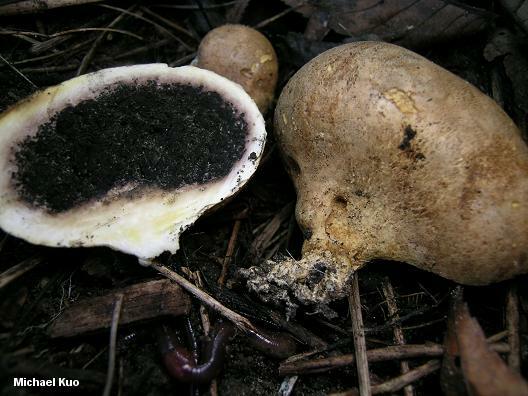 Spore Mass: Fleshy and white at first, becoming yellowish brown, eventually black and dust-like. Chemical Reactions: KOH on surface slowly reddish brown. 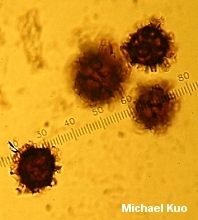 Microscopic Features: Spores 14-20 µ; round or nearly so; densely spiny and reticulate, with spines 2-4 µ long. REFERENCES: (Guzmán, 1967) Guzmán, 1970. (Guzmán, 1970; Smith, Smith & Weber, 1981; States, 1990; Sims, Watling & Jeffries, 1995.) Herb. Kuo 09210402.